Some of you felt that the guy who gave me advice during my run this weekend was a douchebag. I think that's a bit harsh - it was a little weird but at least he was well-intentioned. To give some perspective on what a REAL douchebag is, I've been sitting on this post for a while but was reluctant to share it. Perhaps it's time. Yes, that is an exact quote and that is a photo of him I found online. I responded "you are free to try to spit on my medal any time you like." To make matters worse, he's not just some cocky triathlete. He's a USA Triathlon certified coach. 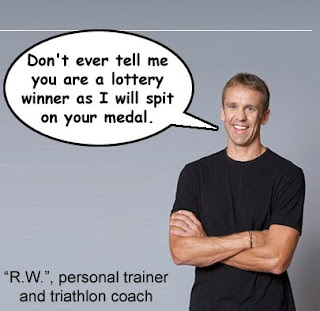 That's right, this douchebag is teaching other people about triathlon. Apparently the USAT's sportsmanship clauses don't apply to him. I do wish him the best of luck in his racing and coaching endeavors. Because if he's successful, then maybe he'll get invited to give seminars and workshops. And I will show up, stand up in a room full of fellow triathletes, and ask him if he would like to spit on my medal. First of all, you should know this: I haven’t been training much. I ran 8 miles of the IMAZ course in November when I still had some Kona conditioning, then I ran 3 miles about a week ago. Not good. Yesterday I went out for a 5-mile run. About a mile down the trail, he had turned around so I saw him again. He stopped me and asked if he could give me some “advice.” He was probably a little younger than me, certainly in better shape but it’s not like he was Stuart Anderson or anything. (Laura, that’s for you.) So I just told him “sure.” Then I noticed that he was wearing an Ironman World Championships finishers cap (2007) so I felt this instant connection and thought he might give me some super-secret training tip. Instead, he told me that I was shrugging my shoulders and looked like I was too tight as I ran. He also said that it looked like I was in pain. These are rookie mistakes and to be honest I felt a little embarrassed to be called out about it. I should have just said “thank you” and moved on, but I was also a little defensive. I've been feeling a little insecure lately so for some reason I felt the need to both build myself up AND provide excuses. So I pointed out his hat and said “you did Kona? I did it back in October and I really haven’t done any training since then and I’m just starting to get back into it so I'm a little rusty." Well apparently he didn’t feel any bond or connection because he just repeated “yeah well bring your shoulders down, you’re too tight.” I told him “thanks, have a good run” and left. Now you may ask yourself, “well Wedgie, WERE you in pain and shrugging your shoulders?” THAT’S NOT THE POINT! Did you ever think that maybe I wouldn’t be so tense if people didn’t tell me I was running incorrectly? So there. When I watch other people race, I am very nervous for them. So when I'm racing, I worry about other people being nervous about me. I wanted to make sure my support crew knew everything was OK. I saw them right at the very start of the run, and they just started chanting "Wedg-ie! Wedg-ie!" Which was nice and everything, but I was trying to get them to shut up so that I could issue a statement. They just wouldn't stop cheering me- how rude. They finally quieted down, and I simply said to them "I'm having a lot of fun." And that was absolutely true. I WAS having a lot of fun. I had a good swim, a good bike, and was still just in awe of the fact that I was racing in Kona. This may sound contradictory, but although I had fun all day (and night) long, the run itself was most definitely not "fun". Those first ten miles or so were HOT. I did a lot of heat training in L.A. but Kona was just a whole other level of pain. I think they should have had aid stations every 1/2 mile because the cold sponges they were handing out (thank God for them) would only last a few minutes stuffed under my hat or in my tri-top. I saw Stephanie about a mile into the run, and she ran with me for a couple hundred yards or so. Poor Sara was busy sipping Mai Tais or something when I came by, and Stephnaie guilted her into putting down her drink to come run with us. Her sacrifice is duly noted. You may recall I had a fantastic T2. Well the truth is, I kind of cheated. I wanted to have fresh socks for the marathon, so I packed an extra pair in my T2 bag and was supposed to change them in transition. But I really was going for a fast T2, so I decided I would just take them with me and change at the first aid station. I don't know what i was thinking, but I just assumed there would be chairs waiting for me in the support areas. Of course there wasn't any place to sit down. Instead, I found a small tree with a somewhat-horizontal branch on it and kind of tried to balance on it while changing my socks. It was awkward to say the least. I certainly would have changed much faster in T2, but I have no regrets. Here was my plan for the marathon: run 55 minutes, walk 5 minutes. Run 55, walk 5. Repeat. I would do an average of 12-minute miles, (5 miles each hour) which would let me finish in about 5:15, with a 15-minute buffer to meet my 5:30 marathon goal. This is how I trained, it worked very well in rehearsals in Griffith Park. The first 5 miles took me about 1:04. A little slow, but that time included the changing of the socks and also a bathroom break (again, I didn't pee in T2 like I should have because I wanted the best T2 possible.) The next 5 miles took me about an hour, so I was right on pace. The problem is that during my second 5-minute walk, I saw Annie and the support crew. Now I know that the worst thing to see when watching a race is to see your athlete walking during the marathon. It usually means they've bonked. So I felt bad for them potentially feeling bad for me, so I kept reassuring them, "no, this is normal. I'm SUPPOSED to be walking now. I'm actually right on schedule, everything is fine!" (Was I telling them that, or trying to convince myself?) They walked with me for a few minutes until I hit the 2-hour mark and then I started running again. Left them in the dust. Somewhere between mile 10 and 11 there is a hill leaving town. It's somewhat steep, but maybe only 5 blocks long. A first I thought I should just walk up it, but since it wasn't my scheduled walk-time I was worried about "cheating" this early in the race. I assumed there would be plenty of times later on I'd want to do some extra walking. So I ran up the hill. Big mistake. It just completely wiped me out. By the time I got to the top I was exhausted and cramping and my stomach wa s feeling really bloated. At the mile 10.5 aid station, I pulled over to do the Steve Kern Maneuver (sticking your fingers down your throat to force a gag reflex.) I didn't puke, but I was able to spit up some gross colors and it really did make me feel much better. It was kind of funny, I was thinking to myself that I was making some really loud, disgusting noises but that it was OK: this is the Ironman World Championships and I was not going to let a little thing like personal dignity get in the way of my race. By mile 11, I was walking and I knew I had to come up with a Plan B. I told myself I would walk to mile 13, the halfway point, and then reassess my situation. And I also told myself I wasn't going to worry about it. I wasn't in much danger of not finishing, and I was still looking at a possible PR. So I just walked. Part of my problem was that I was under-nourished. I needed calories. The Ironman Perform drink wasn't cutting it, but I told myself I would not eat any solid food until after mile 13. You might think "if you're hungry, you should eat." But I know myself. I have very little willpower. I cant just eat one pretzel. I knew that if I got just one little taste of that Salty Slice of Heaven I would just start grabbing handfuls of them. And then 30 minutes later I would start feeling bloated and sick. I was really craving the chicken broth, but unfortunately the stations weren't serving it yet. So it was just water and sports drink for me.